Traveling to Europe? Don’t overlook Budapest! We’ve spent over 4 months traveling around Europe and Budapest is our favorite European city. 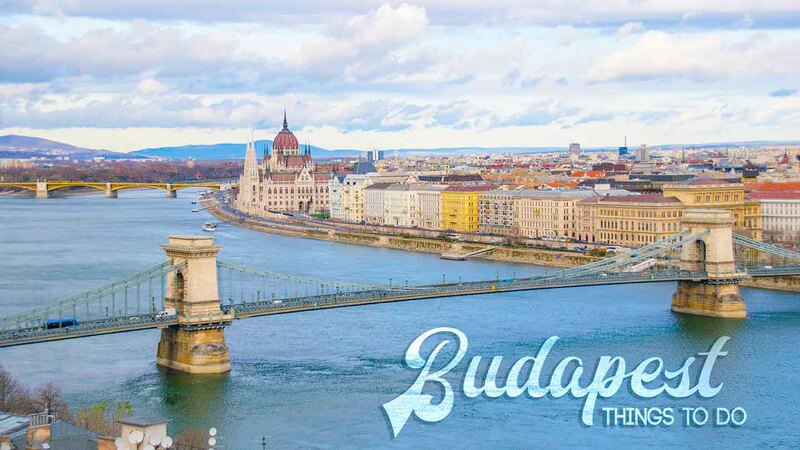 We also love Barcelona, Prague, and Paris but Budapest is the whole package: beautiful, safe, tons of things to do, tasty food, good beer, and budget friendly! We’ve put together the best things to do in Budapest to put on your Budapest itinerary. The Chain bridge is easily Budapest’s most famous bridge that connects Buda and Pest. The Chain Bridge was built in 1849 with its official name István Széchenyi. If you’re sightseeing in Budapest start your morning on one side and walk across the Chain Bridge to the other side. We highly suggest seeing the Chain Bridge at night, it makes for some great night photos. The Buda Castle is at the top of Castle Hill and the complex is home to the Buda Castle (formerly Royal Palace), National Gallery, and the Budapest History Museum. The Castle was home to the Hungarian kings was completed back in 1265. The Buda Castle was declared a World Heritage Site in 1987. The best way to explore the castle is on a guided tour, 2-hour Castle tours can be booked online here for $19 with Viator. There are several Budapest city tours that include visiting the Buda Castle, click here to see all Budapest tours. The grounds are open 24 hours a day but Buda Castle hours are the same as the museum Tuesday- Sunday 10am-6pm. There are several festivals at the Buda Castle throughout the year: beer festival, wine festival, chocolate festival, palinka festival, etc. Fun fact: Budapest is actually two cities, Buda and Pest which are divided by the Danube River. The two cities are connected by several bridges the most famous being the Chain Bridge, and each side of Budapest has several tourist attractions and each is very different. We suggest spending at least 3 days in Budapest. There are a ton of things to do in Budapest but as an added bonus Budapest is super affordable. If you time your visit right you can watch the changing of the guards at the Parliament. 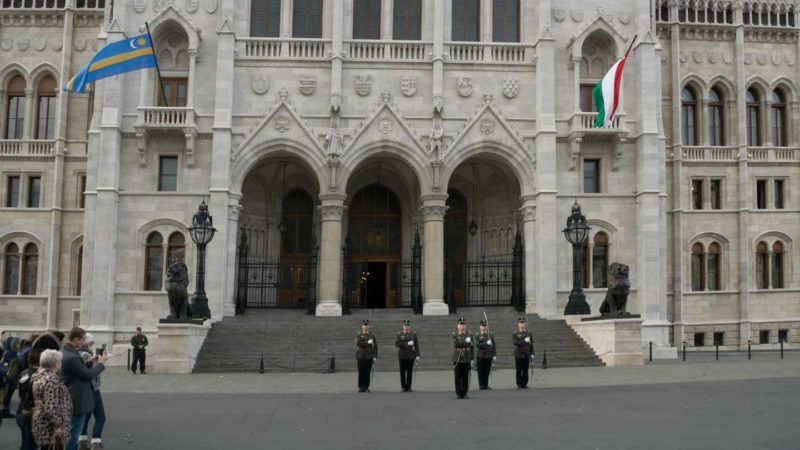 You literally can’t miss the Parliament Building it’s Hungary’s most recognizable building and it’s huge! The Hungarian Parliament is the 3rd largest parliament building in the world and the largest building in Hungary. It took 17 years to construct and it was finally finished in 1902. There are parliament tours but since tours are limited lines can be long and it often sells out days in advance, it’s best to book a Budapest Parliament tour in advance online here for $26. Head to the Pest side at night to get a great photo of the Parliament Building lite up at night. Relaxing in one of the Budapest baths is a must, our favorite bath is the famous Széchenyi baths. It’s the perfect place to relax after a long day on your feet seeing all the things to do in Budapest. The baths are supplied by two thermal springs which heat more than 20 pools in the complex that range from 65°-104°F (18°-40°C). The Budapest baths are said to help medically with degenerative joint illnesses, orthopedic and traumatological post-treatments. The Széchenyi baths are the largest medicinal bath in Europe and the prettiest if you ask us. If you happen to be in Budapest on a Saturday consider going to the Széchenyi baths pool party on Saturday nights 10:30p.m.-3a.m. for an unforgettable night. For the cheapest ticket Budapest Bath party tickets click here $20 fast track (no waiting in line), all-day pool access, and cabin usage. It wouldn’t be Budapest without the Danube River. There are tons of river cruises in Budapest from lunch/dinner cruises, half day cruises, or even a Danube River cruise to/from Germany. Click here to for all river cruises available. We actually took a Christmas market cruise that started in Budapest and ended in Germany one year. One of the best views of Budapest is from the lookout at Fisherman’s Bastion. Originally the towers were lookout towers but now it’s the best lookout in Budapest. There are 7 towers which are free to enter, some of the upper towers have a small fee (under $3) during peak season. When you’re visiting Matthias church just walk around the balcony to reach the Fisherman’s Bastion. A visit to St. Stephen’s Basilica is worth the trip alone but head to the observation deck for an epic panoramic view of Budapest. The church is free to enter, there is a sign suggesting a 1 Euro or 200 HUF donation. There is an observation deck which costs HUF 400 to access using the stairs of HUF 600 taking the elevator. It’s 365 stairs to the top or an elevator April 1-October 31st. We visited in December so we walked up but the staircase is gorgeous make sure to pop in for at least a photo. Don’t eat before heading to the Central Market Hall the oldest & largest indoor market in Budapest. The market has more than enough food stalls and restaurants to fill you up. We highly suggest picking up some Hungarian spices & liquor to bring back home the prices are the lowest you will find. 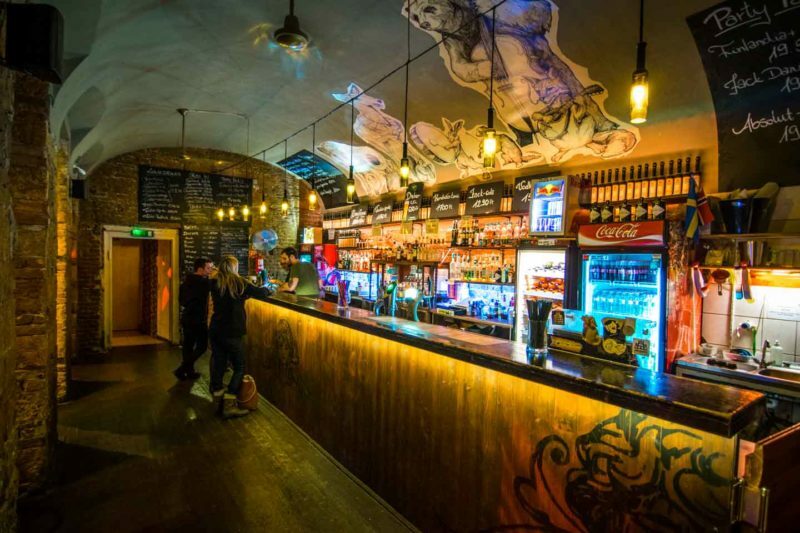 It’s hard to describe what a ruin bar is, the Budapest ruin bars are a one of a kind bar. Ruin bars have been around since 2001 in Budapest’s District VII neighborhood aka the old Jewish quarter. The ruin bars are in abandoned buildings that have been left after World War II. If you are just walking down the street you may not even realize it’s a bar but as soon as you enter your transformed into another world. Each ruin bar is different but they all are full of character expect every room to be different and very strange. The oldest ruin bar in Budapest is Szimpla Kert, which is open daily. Ruin bars are super popular and can get crowded we suggest going before 11 p.m. to avoid the long lines and to grab a table. There are Budapest ruin bar tours that visit several bars but you can easily create your own ruin bar crawl. Don’t forget the insurance. We don’t take the insurance offered when purchasing flights/hotel, but instead, we always get travel insurance with World Nomads. Which coverage includes medical, trip cancellation, your belongings from theft or damage, baggage, car rental coverage, and much more. The Dohány Street Synagogue typically called the Great Synagogue, is the largest Synagogue in Europe and the second-largest synagogue in the world. Built back in 1854 the synagogue can seat 3,000 people. Located on the same street is the Jewish Museum, memorial, Heroes’ Temple, and a cemetery. One of the most unique tours in Budapest is the Jewish Cemetery Tour with Budapest 101. Visit the Salgótarjáni út cemetery is the oldest Jewish burial ground on the Pest side of the city. Most of the Jewish population was forced out of Budapest during World War II, therefore the cemetery turned into ruins. The trees and plants began to take over the graveyard. You’ll have to watch your step as many of the tombs have fallen through the ground or opened and looted for any goods. Some of the tombstones and burial chambers are massive and really gorgeous, even though that sounds weird to say a headstone is pretty…It’s a strange place to visit but really photogenic. The cemetery is not opened to the public but can be opened for visitors if arranged in advance, which is why you will need to go with a local. We went with Budapest 101 and highly recommend them. At the end of Andrassy Avenue is Heroe’s Square the largest square in Budapest. The square has iconic statues featuring the Seven Chieftains of the Magyars. Visit Heroes’ Square before or after visiting the Széchenyi baths. Don’t leave Budapest without trying a local favorite Pálinka, which is a fruit liquor made with different fruits similar to brandy. This firewater has a lot of fruit flavor come through as you throw them back. Pálinka is commonly drunk before or after a meal and is the go-to spot at the Budapest ruin pubs. Ride one of the world’s largest traveling Ferris wheel standing over 200 feet tall with 42 cars. Every night the Budapest Eye Ferris wheel lights up the square with over 10,000 colored lights. No matter if you ride day or night the Ferris wheel has great views to offer. Operating daily in Erzsébet Square. Come the end of November Budapest turns into Christmas Market heaven. We started our Christmas market cruise with Viking River Cruises in Budapest and we both agree Budapest had the best Christmas markets in Europe. The “Shoes on the Danube Bank” is a memorial to honor those who were killed by the Arrow Cross militiamen during World War II. There are 60 pairs of shoes placed on the ledge in memory of 3,500 people who were forced to take off their shoes and were literally shot the edge of the water where their bodies were swept down the river. Hungarians love the smoky and savory red spice of Paprika. You can find in just about every dish while in Budapest. Bring some of the spice home with a tin of Paprika – available at every market in town. The easiest and most scenic way to the Buda Castle is to ride the Buda hill funicular to the top. The Buda Castle Funicular has connected the shores of the Danube and the Buda Castle since 1870 and was listed as UNESCO World Heritage site in 1987. There are 2 stations, the lower station is on the Buda side of the Chain Bride and upper station on the Pest side on Castle Hill. There are two trams that run the 300-foot track and will have you to the top in ten minutes. The funicular runs daily 7:30am-10p.m we highly suggest going early in the morning or just before sunset. Matthias church is over 700 years old and one of the oldest buildings in Buda. This gothic style cathedral with a colorful tiled roof is one of the cities best sights. Inside the church is just as beautiful with high vaulted ceilings and ornated decorations throughout. Hands down the most interesting church in the city is the Cave church tucked away in the Gellért Hill Cave. Don’t expect the vaulted ceilings like in the other Gothic churches in the city. This church was built in a natural cave by monks in the 1920s. The name of the church is Sziklatemplom, which in Hungarian means Rock Church. During WWII the church served as a hospital and took in refugees from the war. After the war, the new communist government that took power arrested all the monks and the head monk executed, just for helping people. The cave church is a top sight in the Budapest for both its uniqueness and the history of the place. After a long day sightseeing in Budapest take a sip of Budapest’s locally made herbal liquor. Unicum is basically Hungary’s version of Jagermeister, and it’s said to cure many things. This potent concoction has been made here for over a century according to a secret formula of more than forty herbs and aged in oak casks. Short on time? Check out our 3-day guide to Budapest! It shows to you best way to see all of the city’s highlights during a short itinerary. We split our time between two hotels in Budapest. Our first hotel Kempinski Budapest was right in the center of everything and literally right next to one of the Christmas Markets. Our second hotel the Fraser Residence are basically serviced apartments where we had our 1 bedroom apartment complete with kitchen and washer/dryer which was great for us. Click here to read our complete where to stay in Budapest guide. We’ve had several friends find great places on Airbnb and we know on our trip to Budapest we’ll rent an apartment on Airbnb for several weeks. We hope you have an epic time in Budapest and make sure to pin me! Hungary is the best place according to me. It has all the elements which makes a holiday A WOW experience. Hungary is great and we hope on our next trip we get to explore more of it! Budapest is amazing and we’ll always spend a few days exploring the city, it’s our favorite city in Europe. Loved the pictures! they seem to be super helpful. I am going to make a copy of this guide while I’m there!!! We’re planning to visit Amsterdam, Budapest & Prague between 25 October to 4th November, and I plan to be at the best of three spots at the right time.. Halloween celebrations is what I want to definitely experience!! Any suggestions on where I could go and when to make the best of the limited time I have? You are visiting some of the best cities in Europe! Budapest is our personal favorite city in Europe. I am sure the ruin bars in Budapest would be an epic place to spend Halloween. I would for sure plan on Budapest for Halloween. Have a blast! Hello! Just came across this two weeks before my trip to Budapest and it is definitely very helpful!! However I have a question about the baths. How do you buy the tickets and should you buy them in advance? Are they for the whole day or just for a period of time? I plan to go on a Sunday. Also is there any place to leave your stuff under lock? I take photography as a hobby and I would like to take some nice pics of the baths and then be able to leave my camera in a safe place. There are lockers and private rooms available (for a fee) to leave clothes and valuables. You can buy tickets and stay for as long as you want at the baths. Tickets are available in advance if you are traveling on a tight schedule or peak season. I loved visiting Budapest. It delivered so much more than I expected. It is such a charming city that you can’t help but fall in love with it. The ruin bars were wacky, but what an experience. I highly recommend visiting them. 3 days was perfect, but I could have easily spent more time in the city. This is awesome info, thanks for making such an expansive list! Which Christmas markets were your favorite, or did they have general themes like the Prague markets have? We are going in mid December and are stoked to visit such a gorgeous city! No problem, glad our things to do in Budapest could help plan your trip to Budapest. The Christmas Markets in Budapest all kind of run into each other. My favorite was in front St Stephens Basilica, head up to the top of the church and look down on the market for a great photo. Safe travels. It’s hard not to fall in love with Budapest. Fantastic photos guys! Who knew that the City was actually two different cities. Despite the beautiful architecture – I think the ruin bars look particularly interesting. thanks for the info – this is bookmarked ready to read again before a future visit! Yep Budapest is two cities, we surely didn’t know that before visiting Budapest. The ruin bars in Budapest are our favorite thing to do at night great vibes. Let us know if you have any other Budapest travel questions. Had no idea Budapest was actually two different cities! Looks absolutely beautiful though, as if the whole city was built to the standards of a royal! The castle is humungous and those baths look spectacular! As somebody who loves cityscape, I would especially love to visit Fisherman’s Bastion Viewpoint! Don’t worry you aren’t alone, we didn’t realize Budapest was two cities either until our first visit. Everywhere you go it’s gorgeous, there are so many things to do in Budapest and take pictures of. We could easily live in Budapest. I’ve always heard such amazing things about Budapest, but never knew it was actually two cities! Your photos have convinced me that everything I’ve heard is wholeheartedly true. I clearly need to visit as a history buff and architecture lover. It looks simply amazing! We didn’t know Budapest was two cities either until our visit, so you’re def not alone. If you’re a history & architecture love then you’re going to fall head over heels for Budapest it’s a gorgeous city. I want to visit Budapest soon! I wish to visit the shoes on the river bank. Such a touching sad story. Thanks for sharing this post and the travel tips. Budapest won’t let you down. Just walk the river bank and you’ll see them, it is really touching. The city has a ton of history. We suggest going on a tour with a local too. I loved visiting Budapest last May. Would love to see the city during the holidays too. Didn’t know about the Cave Church and I was right there! Wonderful seeing the baths without the crowds too. May would be a great time to visit. We’ve visited in November, December, and just a few weeks ago in October. Bummer you missed the church, you’ll have to go back. You have to go to the baths SUPER early in the morning for a peaceful trip. What a great list! The ruin bar sounds amazing. I am such a fan of abandoned buildings! The ruin bars in Budapest are amazing and a must. I suggest going at night for drinks and also during the day (sober) to check out the ruin bars. Have a blast in our favorite city. Completely agree! Budpest is one of my favorite cities in Europe. I love the ruin bars and all of the bath houses. Though I think my favorite is Kiraly – it is not as beautiful or expansive as Széchenyi, but it is so ancient it feels like a trip back in time. There are some awesome gems you mentioned here that I was completely unaware of… the Cave Church and the Abandoned Jewish Cemetery both sound cool. I will have to check those out on my next trip. And good call of the Kempinski – never had a bad stay at one of their properties! We’ll have to note that bath down, we haven’t been to that one yet. Def a ton of amazing places to check out in Budapest. We’ve only ever stayed at a Kempinkski in Budapest, we’ll have to check out some of their other properties. You nailed all the top spots! Budapest is one of my favorite European cities, it’s fabulous! Loving all your night shots. I actually think Budapest is the best place to get the best night shots. Especially the bridge and parliament building. This makes me want to go back and I’ve already been twice! Budapest is full of great night photo spots. The chain bridge is our favorite spot, did you know it’s going to be under construction soon…so those going there won’t be able to get these iconic Budapest Chain Bridge pictures. You should def go back to Budapest! I keep reading about Budapest and more I read more I would like to go sooner than later! I would love to go around Christmas to see the big tree, lights and Christmas markets. I want see all the sights and go to the Ruin Bars, they look fun! Is three days long enough to see everything? Or would you recommend staying a little longer? Three days is a good amount of time but the longer the better like obviously. I think 5 days and you really could dive in deep. The nightlife scene in Budapest is epic,always something going on. There are tons of things to do in Budapest to keep you busy all day long. The Christmas markets were the best in Europe if you ask us. I love Budapest, it is such an amazing city. Loving the list here, and I have to admit, I didnt have enough time to do everything. I think another trip has to be done! Bummer you couldn’t check out all the Budapest attractions, next time you’ll have to spend a few more days in Budapest. Safe travels you two. I did many of the things you describe – like awing at the castle and visiting the Jewish synagogue and of course I loved visiting the old SPAs – so beautiful! Too bad I missed the memorial with the shoes – that looks overwhelming. The spas in Budapest are gorgeous, so many to choose from. The memorial is right on the river bank, next time when you are walking just walk down that way. Budapest is amazing, so many things to do and see. Safe travels. Wow wow wow! This is a brilliant guide to Budapest and I’m definitely using this the next time I go. Really informative and love the photos too. Thanks for sharing! For sure bookmark this post for your next trip to Budapest, there are a ton of Budapest attractions that can’t be missed. Safe travels. My boyfriend and I have been making a list of place we want to visit soon – I think another one just made the list! Great guide, thank you! You should definitely put Budapest on your Europe itinerary. There are tons of things to do in Budapest so make sure to spend at least 3 days in the city. Oh, I miss Budapest so much! The city grew on my day by day. Is the Ferris wheel new? I do not remember hearing or seeing it (I visited September 2016). The Ferris wheel in Budapest was there when we visited in Nov & December 2015 and it was still there last month October 2017. Budapest is addicting, we know we’ll be back. Wow such an amazing details and photographs. Surely using this as a guide on my next visit to the city. Glad we could help. Def bookmark our things to do in Budapest guide for your next trip. safe travels.